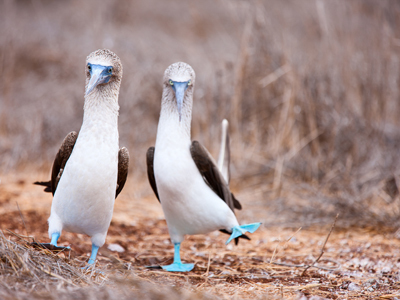 The Galapagos Islands are among the planet’s premiere nature and wildlife destinations. The fascinating volcanic geology, unique flora and fauna, and isolated nature of the islands have pushed them to the forefront of scientific inquiry since the mid-1800s, and research on the 13 major islands continues to play a vital role in our understanding of evolution. As part of this program you’ll visit two islands and get a chance to spend time with the unique wildlife that inhabits the islands: the sea lions, the giant tortoises, the marine iguanas and much, much, more! First stop is the impressive Island of Floreana. The smallest of the islands, Floreana was the first to be populated. A visit to this enchanted island is all about slow tourism, about Galapagos as it was, about pirates, love and mysterious legend. 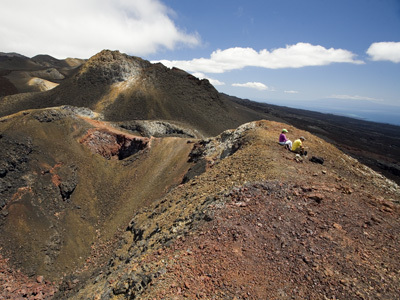 Next is Isabela Island, not only the largest, most volcanically active and most interesting of the chain, but also the least visited and the most relaxed. Lastly, you'll enjoy Santa Cruz Island, where you can relax and soak up the atmosphere in the charming port of Puerto Ayora, a port town with a laid back attitude and great island culture. Walk the white sandy beaches, and swim or kayak in the bright turquoise waters. Welcome to the Galapagos! Arrive on the tiny island of Baltra at the world's first ecological airport. You will be met by your expert local guide who will give you useful background information before you transfer to Santa Cruz via public transport and ferry (No private vehicles permitted). Enjoy a tasty specially prepared boxed lunch en route to the town of Puerto Ayora where your private speed boat will be waiting to take you on a two hour ride to the island of Floreana. Floreana is home to the Galapagos’ smallest population, only 150 people, and is also the least developed and most natural of the four inhabited islands. 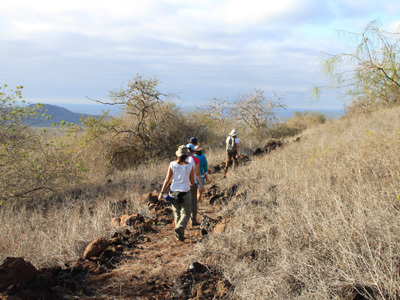 Here you'll be hiking, learning about the fascinating history of the local people, and seeing some of the Galapagos special wildlife (giant tortoises, frigate birds, Darwin's finches, sea lions, and petrels). 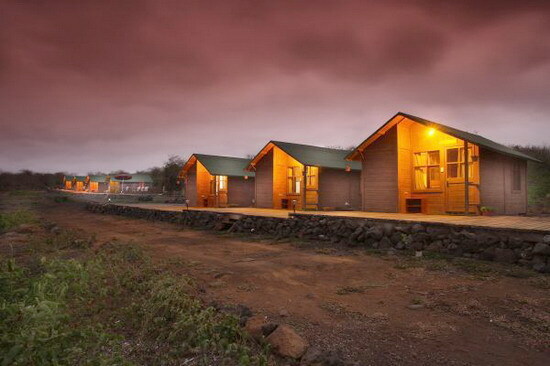 Check in at our lodge overlooking the Galapagos’ most beautiful and secluded bay. A 30 minute walk brings you to La Loberia (a sea lion breeding ground) and then for your first marine encounter, snorkeling and swimming in the warm bright water with sea turtles, sea lions, spectacular rays and lots of shimmering fishes. After breakfast you will leave to explore the Floreana highlands on your open-air bus (chiva), an unbeatable, historic, and comfortable way to see the island. On the way our Naturalist Guide will point out the wildlife and give you an idea of the colorful history of some of Floreana's first inhabitants, such as the Wittmers (whose descendents still live on the Island), the ‘Baroness’, and the pirates that once visited here. They will also tell you about the "Enigma of Floreana", involving the mysterious deaths of several of the Island´s inhabitants, a riddle that has never been solved. After driving into the highlands, you will reach Asilo de la Paz (Peace Haven) where your hike begins. You will walk up to this historic site, explore pirate caves, and visit the freshwater spring that provides water for the entire Island. 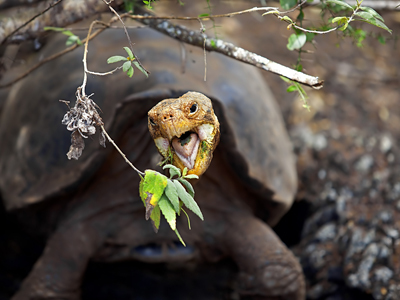 Along the way, you can expect to see giant tortoises lumbering around in the vegetation or even on the trail. You'll leave Asilo de Paz walking down through a rural area where the local people grow produce for their own consumption: this is a fascinating example about how these island people survived in this remote place and over the years were able to develop an understanding of the local environment and now work to preserve their unique agricultural knowledge. Once back on the coast you'll be able to watch the extraordinary behavior of the frigate birds who ‘dance’ as they wash their salty wings in the fresh water. With a little bit of luck, you may be able to see males puffing up the red pouches on their chests in an attempt to attract females. From La Primavera we continue by Chiva down towards Las Palmas, where the Island’s first permanent inhabitant, the eccentric Dr Ritter, lived and is buried. Arriving in 1926, this German physician believed that with a combination of exercise and the right vegetarian diet he would live to be 150 years old. He didn´t, but his story is one of the many strange episodes that still abound on the island. On the way we will see spectacular views of the Floreana shoreline, and on arrival sit down to a special BBQ. 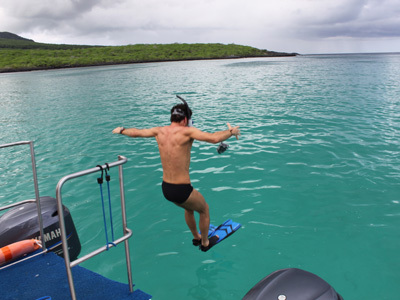 In the afternoon, back at the lodge, we do more marine exploration, snorkeling, kayaking and stand up paddling. Today you'll take an early morning speed boat and transfer to Isabela Island where you will check into your hotel. Your Isabela adventure begins with a tour of the Tintoreras, a group of small islands near the village of Puerto Villamil, that are named after the white tipped ‘Tintoreras’ reef sharks that swim in these calm waters. A Galapagos in miniature on the Tintoreras you will see almost all of the archipelago’s iconic wildlife: white tipped sharks, sea lions, turtles, rays, penguins, and of course pelicans and blue footed boobies. You will have a chance to snorkel in the bay – and don’t be surprised if some of the penguins or sea lions jump in to play alongside you in the water. In the afternoon you'll walk from your hotel to the local giant tortoise-breeding center and on the way you might catch a glimpse of pink flamingos feeding in a lake. Once at the Center, our guides will explain the process of breeding and then releasing into the wild, these giant slow moving creatures whose Spanish name (meaning saddle) gave the Islands their present title. The breeding center is an important conservation tool and it is here that the islands’ giant tortoise population is presently recovering. You have the whole day to explore the Isabela highlands, and you'll start by hiking up to the crater of the Sierra Negra volcano, and then to the rim of the Volcan Chico. This fascinating walk usually begins with some morning fog and drizzle which sometimes persists in the shadow of the volcano, adding to its mysterious character. But when you reach the rim of the Sierra Negra crater, the second largest in the world after the Ngorongoro in Tanzania, you will see why it has been worthwhile. The crater is so large, and the views so expansive, that photos don’t even do it justice, but you should bring your binoculars and camera anyway! Later, as you head towards Volcan Chico, you may get the feeling you are walking on Mars, but while the landscape appears desolate, a closer look reveals small lizards, scurrying about among the rocks. After Volcan Chico, under the shade of a lovely “jaboncillo” tree, you'll enjoy a well prepared picnic lunch with the chance to enjoy some spectacular views over the central and northern parts of Isabela Island. In the distance, you will be able to see Fernandina, Pinzon and Santa Cruz Islands. You will then head back down to complete your day of hiking (16 km in total) and relax on the beaches of Puerto Villamil. This morning you'll leave from the Villamil dock and the white sandy beaches of Isabela and paddle to Island Bay. En route you will be looking for turtles, rays, penguins, and blue-footed boobies; sea lions will probably paddle along with you as well. After watching the wildlife in the Bay, you will paddle back to the Villamil dock. In the afternoon, you'll bike the Wetlands Trail where you can see marine iguana colonies and a number of different types of mangroves trees (all four can be seen here) as well as enjoying the network of trails, beaches and historic sites. At the end of the trail is the Wall of Tears, built in the late 1940’s by Second World War prisoners held at the US base on the islands. Your guide will explain the importance of the Wall of Tears, giving you a glimpse into the lives of the island’s previous inhabitants. On this network of trails you will catch some beautiful views of the village below and you will have the chance to see birds and possibly wild giant tortoises. Today you'll start early, catching a speedboat in the morning and heading to Santa Cruz Island. From May to November, a flight is recommended rather than transfer by speedboat due to the possibility of rough seas. When you arrive at Santa Cruz, you will enjoy a hearty breakfast close to the docks before heading up to the highlands for a busy day of multi sport activities. You will be driven to an off-the-beaten-path area of Santa Cruz Island, and when you reach a high point on the road you'll switch to mountain bikes for a long downhill glide on freshly paved roads to Garrapatero Beach. On the ride, you will pass small farms and enjoy views of the ocean and the distant islands. Once you are on the beach at Garrapatero you may see a few local families, but few, if any, tourists. You will paddle the bay in sit-on-top sea kayaks, enjoying your last day on the water in the Galapagos, while looking for sharks, rays, turtles, and sea birds. Later you will have a specially prepared lunch before heading back to Puerto Ayora and your next adventure. Once back in the town, you will have the option of staying and shopping for souvenirs, or (if time allows) walking the 3 km boardwalk to Tortuga Bay. 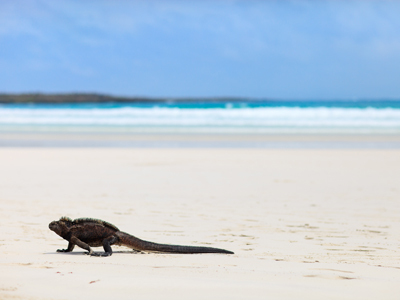 At Tortuga Bay you can walk on the beach, swim, or even snorkel at one of the most beautiful beaches in the Galapagos. Tonight you'll stay in Santa Cruz’ largest town, the small picturesque port of Puerto Ayora. Although it has the largest population in the Galapagos, Puerto Ayora is still a small, intimate place where you will find friendly local bars, shops, and restaurants, as well as places to stroll along the water´s edge. There is everything you need for a mellow night in the Galapagos. After a morning visit to the Charles Darwin Research Center, we transfer to Baltra for our return flight back to mainland Ecuador. Of course, if you’ve fallen in love with these ‘enchanted’ isles - many people do - you can decide to extend your stay for a few days. There’s lots of scuba diving and naturalist day trips you can take to explore some of the other fascinating Galapagos islands. La Casa de Marita is a small and charming boutique hotel in Puerto Villamil. Just about 2,000 people inhabit the island of Isabela, in Galapagos: the largest, most protected island in the Galapagos archipelago. The population lives in tiny Puerto Villamil, a friendly village that houses both locals and travelers, within one of the most unique ecosystems in the world. The sleek and modern Villa Laguna is idyllically located in Puerto Ayora on Santa Cruz Island. Centrally set in the enchanting Galapagos Islands, Puerto Ayora offers easy access to many of the region's most desirable adventures. The property's white walled structure features a peaceful ambiance in paradise. 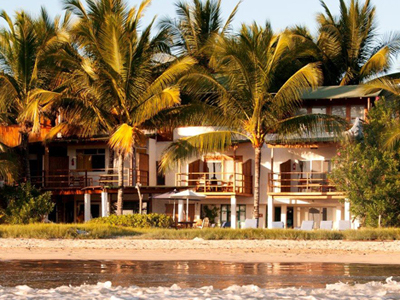 Hotel Villa Laguna is a cozy and safe retreat that promises a pleasant experience. Take a dip in the fresh-water swimming pool, relax on the rooftop terrace overlooking Las Ninfas Lake, or venture into Puerto Ayora to enjoy the lovely waterfront bars and restaurants. This is just one of many authentic travel experiences offered by Global Basecamps. 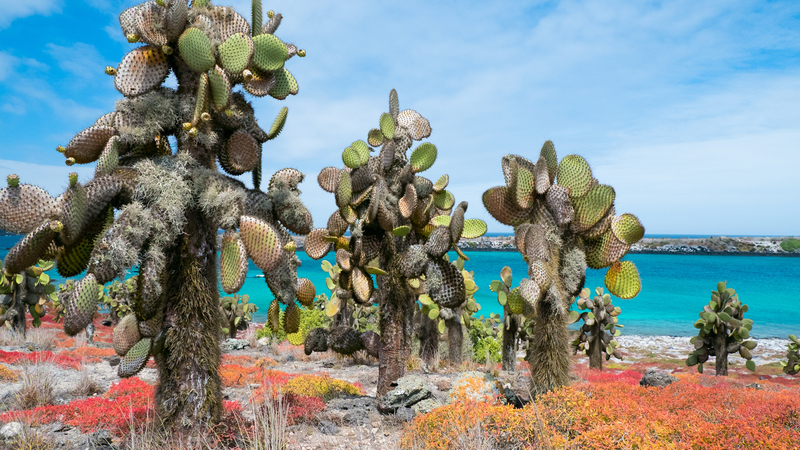 If you are interested in more unique destinations to The Galapagos Islands with unprecedented planning and extraordinary service visit our main Galapagos tours page to browse other sample trips.